A Somali soldier helps a civilian who was wounded in a blast in the capital of Mogadishu, Somalia, Saturday, Oct. 14, 2017. Somalia's president has declared three days of national mourning following a deadly truck bombing Saturday in the capital, Mogadishu, which left many people dead and dozens injured, including a VOA reporter. 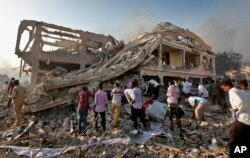 Somalis gather and search for survivors by destroyed buildings at the scene of a blast in the capital Mogadishu, Somalia, Oct. 14, 2017. Earlier Saturday, the blast occurred near Zobe, a busy intersection in Somalia’s capital, killing more than 50 people, health officials and witnesses said. Mahad Salad Adan, a Somali lawmaker who sustained a slight wound from the blast, told VOA that more than 100 people, most of them civilians, were killed in the explosion. He said more 200 others were wounded as Mogadishu hospitals struggled to treat the wounded. Abdulkaidr Mohamed Abdulle, a VOA Somali correspondent in Mogadishu, was among the injured. His wife, Samira Abdirahman Sheikh Adam, confirmed to VOA that he had sustained injuries to his neck, head and right hand. There was no immediate claim of responsibility for the bombing, but similar attacks have been carried out by the Islamic extremist group al Shabab. The group, which is linked to al-Qaida, is trying to overthrow the government in an effort to establish strict Islamic rule. The United States and the United Nations strongly condemned Saturday's blast and offered condolence to the lives lost and those wounded in the attack. Buildings around the area were leveled by the explosion from a truck bomb, and dozens of destroyed cars littered the streets. Health officials said Saturday's bombing was the largest blast in recent memory in Mogadishu. They also called for residents to donate blood to help with the wounded. Government soldiers had cordoned off the area, and officials said the death toll is expected to rise as rescue workers find bodies in the rubble. Most of the victims were civilians. The exact target of the blast remains unclear, though there are several hotels frequented by government officials and members of various diaspora communities. “This is a disaster. We ask all Somalis to reach us, to help us in the search of dead bodies under the debris. We appeal to the doctors, to those who have digging machines,” Mogadishu Mayor Tabid Abdi Mohamed said on government radio. Saturday’s blast came hours after al-Shabab militants regained control of Barire, a strategic Somalian town in a farming area along the Shabelle river, 45 kilometers from Mogadishu. The explosion also comes two days after Somalia's defense minister and military chief, who were leading the fight against Islamist militants, both resigned from the government, citing personal reasons. Some analysts believe militants tend to carry out such attacks when there are security lapses. “The resignation of the country’s defense and military chiefs gave the militants a gab [opening] to carry out such disastrous attack,” said Mogadishu University's Dr. Abdul Kadir Liban Isse.